Here’s a scary fact: The average user spends 79 minutes a day on their phone browsing the Web or using apps (source: AdMob). Who has time for love and meaningful relationships when there are Twitpics to post and Angry Birds levels to beat? But it isn’t exactly like that. Contrary to the popular belief that technology has destroyed meaningful human interaction, you can use your phone in lots of ways to meet and date new people or to improve your existing relationships. But be careful: Sometimes using your phone as a means to find love can work against you. Think about it--when arranging dinner plans for a date or with your partner or spouse, did you call or text them? Chances are you probably did most of the planning via text. Texting is certainly preferable if you’re arranging a date with somebody you don’t know very well. Let’s face it: Phone calls are awkward, and it is less stressful to send out a 140-character message telling them where and when to meet you. But texting can have some interesting implications for budding romances. For example, some people feel the need to text their love interests relentlessly. Whether it is mundane facts about their day or “Missin U” type texts, this person shows their affection through SMS. So tread lightly: If you don’t reply right away, they’ll probably take it personally. If you’re the type that doesn’t like to text a lot (or still have a numerical keypad on your phone), you’re going to have to gently explain that to them—or move on. Meeting people online was once thought of as taboo, desperate, and a little creepy. Thanks to those ubiquitous eHarmony commercials, we now know that normal, attractive-looking people also find love online. And these days, it is even easier to find your future partner on the Internet thanks to mobile versions of your favorite dating sites. Sites like OKCupid, Match.com, and Plentyoffish all have compatible mobile apps. Basically, these apps are designed to give you access to the most-used features of the sites. For example, the OKCupid app alerts you whenever you have a new message, and it lets you browse matches and see who has been scoping you out. You also have access to the IM client within OKCupid. The Plentyoffish app lets you check your inbox messages and view your matches. It also uses some location-based technology to show you matches in your area. One app you might not be familiar with is Flirtomatic, which is part social network and part dating site. More popular overseas than in the United States, Flirtomatic lets you “flirt” with strangers (or friends) via either the dedicated mobile app or the mobile Web (for the non-smartphone users who also deserve love). You make a profile, and instantly you’re connected to thousands of other profiles. The service seems more like a fun way to waste time than to find true love, but if you’re seriously looking for your soul mate, you can search for people near you who share similar interests. But be cautious. That sweet guy with the big green eyes who loves puppies as much as you do could turn out to be a one-armed ex-con who has never met a puppy he didn’t hate. When meeting people on one of these services, make sure you arrange to go to a public, well-lit place, and alert your friends in case you need to bail. Location-based apps that allow you to check in to a bar or restaurant, like Foursquare or Gowalla, are all the rage right now, especially since Facebook has jumped on the bandwagon. They can help friends find each other during a night on the town, and they’re useful for sharing tips about a hot-drink special in the neighborhood. But these apps are also a good way to keep tabs on your partner. Facebook even allows users to check in the people they’re with at a given location, indicating not only where they are but who they’re with. So if your girlfriend just checked into the Slanted Door with her ex-boyfriend, you should probably check up on that. I've also heard of people using these apps to avoid exes. You're about to hit up the gym decked out in your grossest sweats, but--oh, wait--your ex-husband and his new girlfriend just checked in. Better wait until after dark to avoid an awkward confrontation. Facebook will also send you a notification on your phone when one of your friends checks in at the same place you've checked in. This is nice because if that hot girl from your bird-watching club checks in to your grimy local dive, you may have a small window of time to sober up and brush your hair. For the truly desperate, a handful of apps can alert you to locations where you might score a date. The lamely named Where the Ladies At app for the iPhone uses Foursquare’s APIs to determine exactly where the most “ladies” are concentrated. Similar apps can help you track down other demographics of people, but I'll let you discover those on your own. For those with spouses or partners traveling or working overseas, the next best thing to actually having them around is video chatting with them. And now, you don’t have to be tied down to your PC to get some face-to-face action with your loved one. 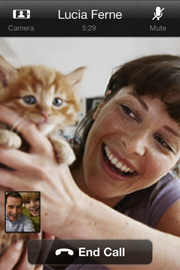 Most of today's high-end smartphones, such as the iPhone 4 or EVO 4G, have front-facing cameras and come preloaded with video-chatting software like Skype or Yahoo Messenger. And what is a more romantic way to ask somebody out than by sending them a Google Calendar invite for dinner at Chez Panisse at 8 PM? Or take it a step further and send your boyfriend or girlfriend a Calendar invite for “Our Wedding” next year, location TBA? Okay, maybe not.